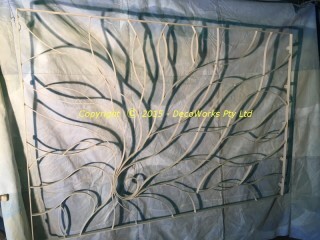 Started work making artistic security bars for a front window today. 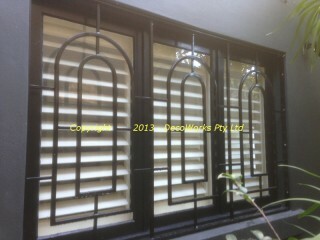 The client did not want anything resembling security bars to avoid that *caged in* feeling. 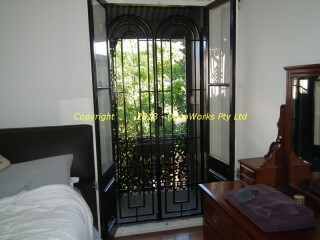 It was particularly important for the this window as it is quite large at 2.2m x 1.5m and looks out from the lounge room onto the street. 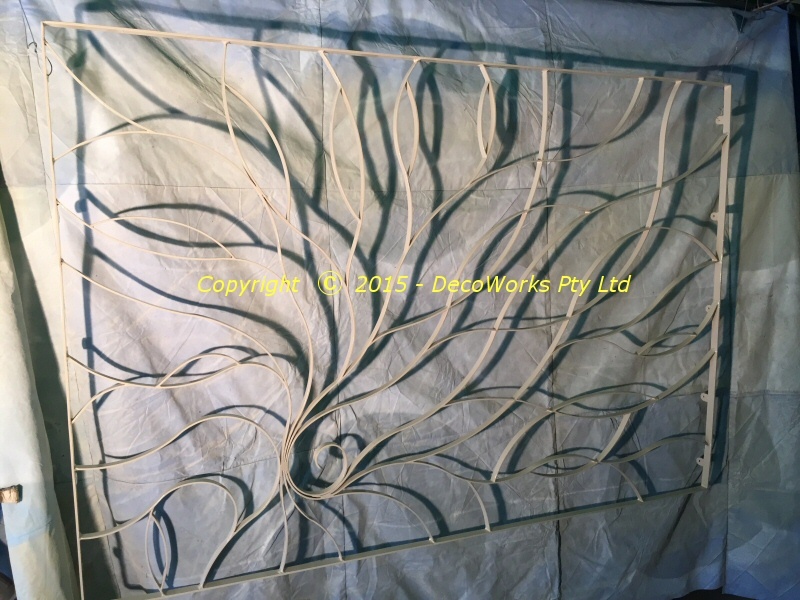 The final design evolved into a sinuos group of ivy vines with no straight lines. 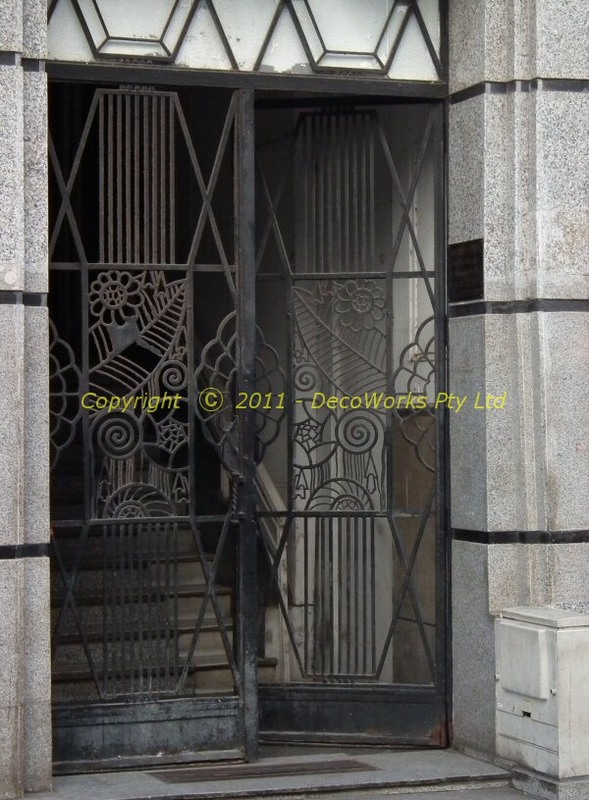 Long term corrosion was of concern for the client so these artistic security bars are made from stainless steel. They will outlive the house. 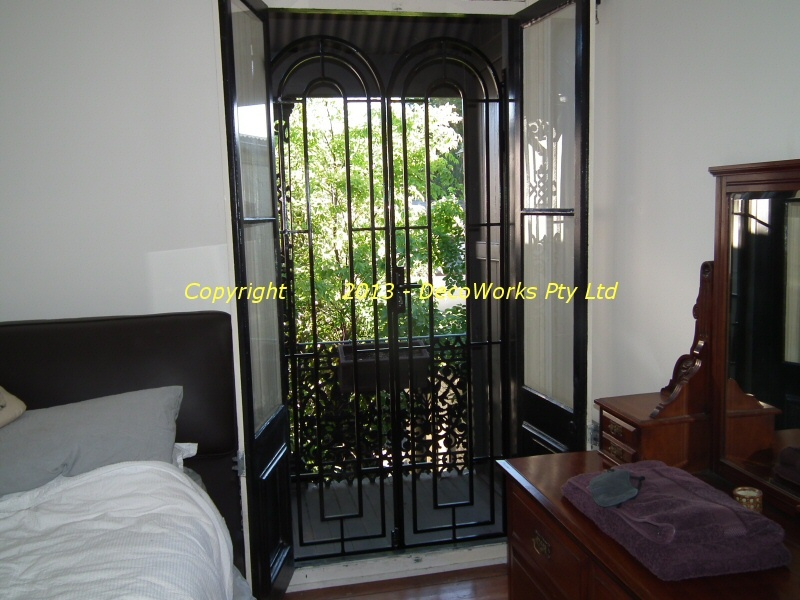 Stainless steel is an excellent material to use for custom security doors and bars which, because they are one-offs, are more expensive to build. 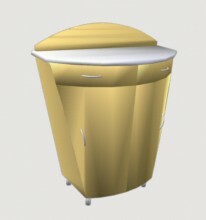 By spending a bit more for stainless steel materials the client is guaranteed a product that will stand the test of time and be a sound long term investment for their property. Welding the stainless steel parts together proved to be a difficult job. 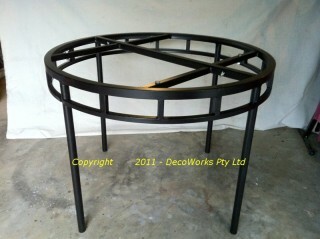 The design is all curves which had to be joined together seamlessly. 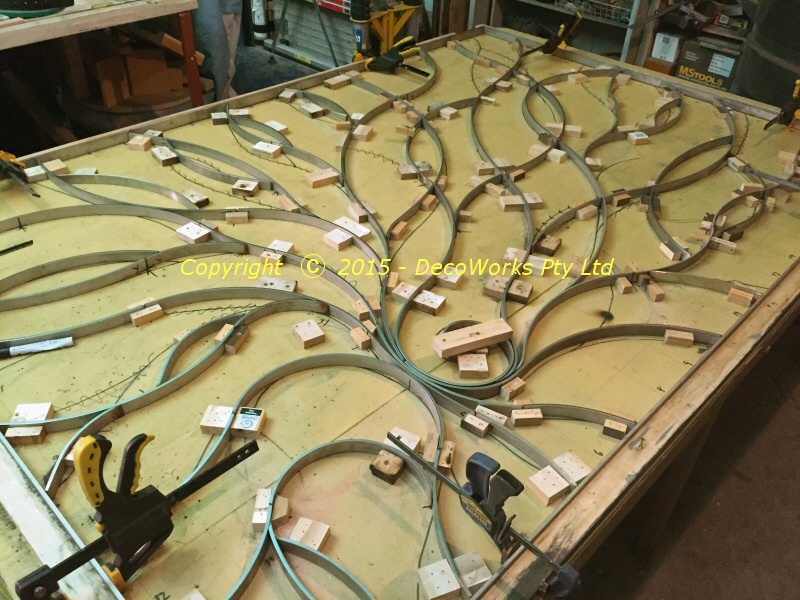 Each weld was executed and smoothed one at a time because most of the welds would be inaccessible in the completed grille. To reduce warping the grille was welded in sections with the outer frame being the last part attached. 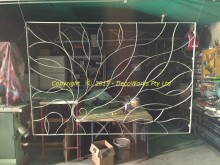 The welding process took three days. 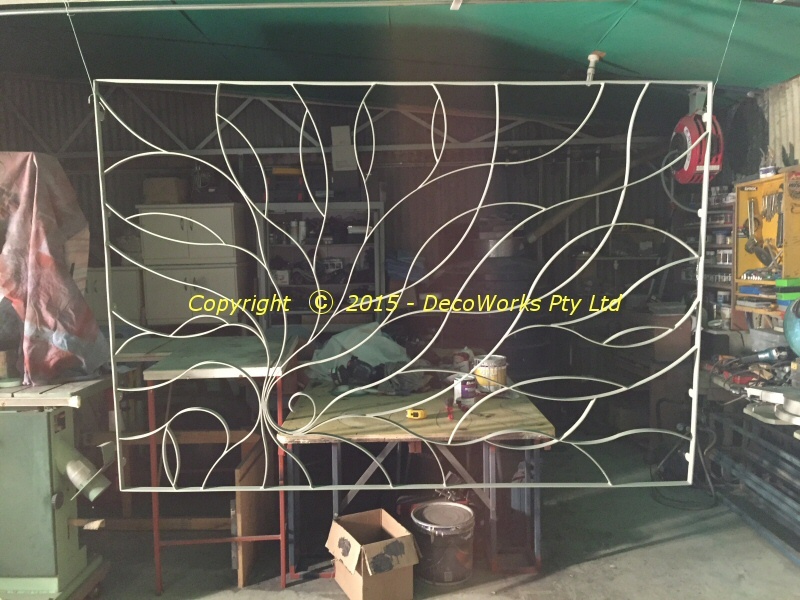 Completed artistic security grille with primer coat. 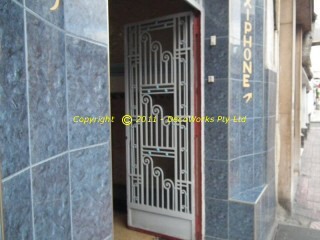 Here are some photos of a recent Princess arch theme security bars installation. 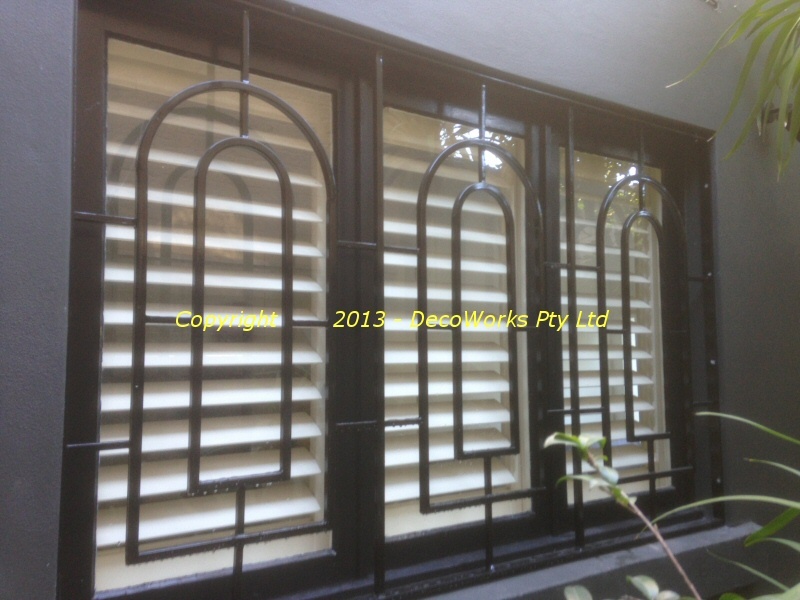 These arch themed security bars were inspired by the arched windows and door on the front facade of the Sydney terrace house pictured below. Other windows in the house also have arched sections which have been mirrored in their respective security bars. The Princess arch theme in these DecoWorks designs is uncommon due to the extra work involved in making several concentric curves of various diameters. 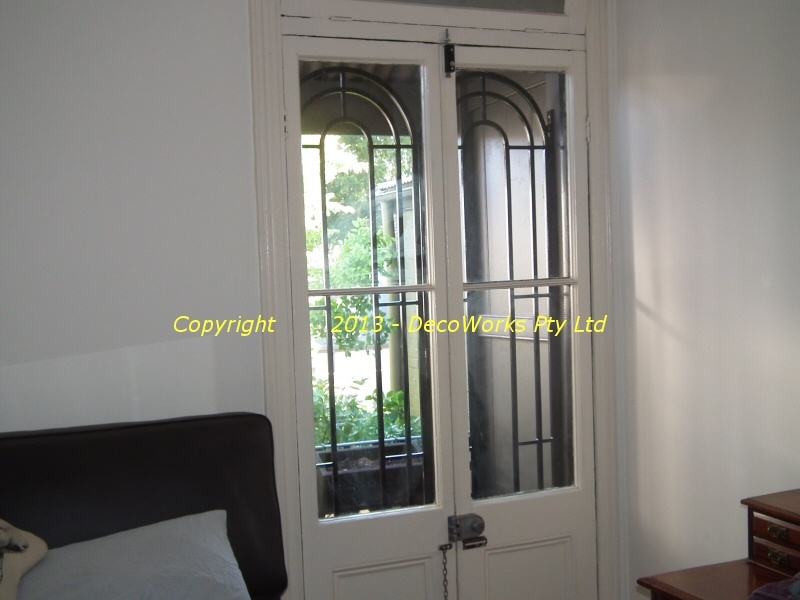 Usually there is a single arch within a rectangular door frame. 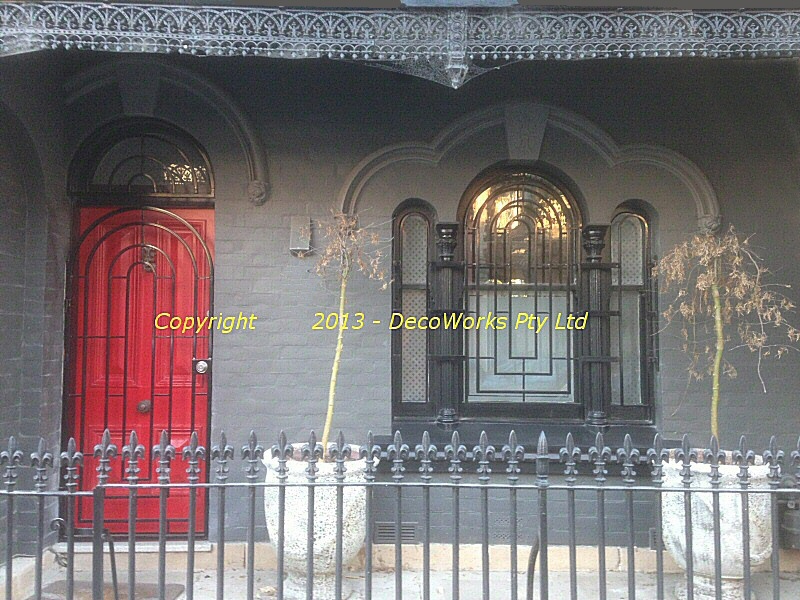 In our designs the arch theme is emphasised by using an arched door frame instead of a rectangular one. 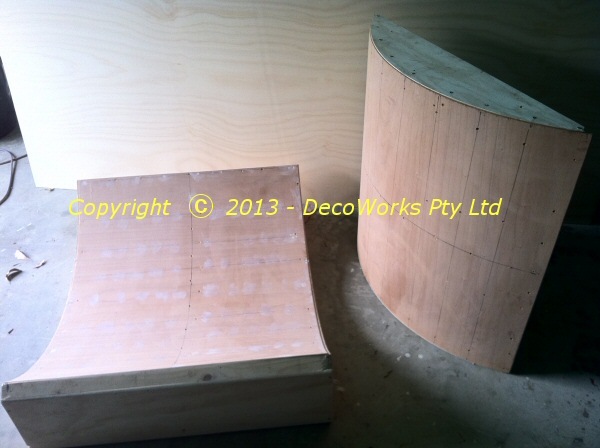 There are several steps required to make the curved cabinet doors required for the custom design shown on the right. 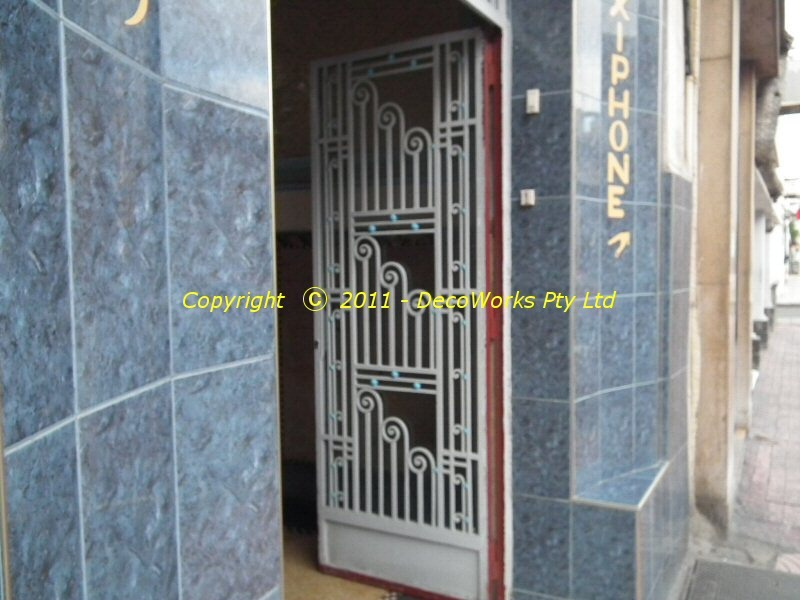 What complicates this design is that the curved doors are also tapered. 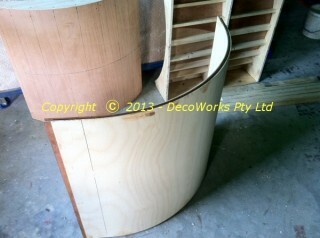 This makes the join line between the sides of the cabinet and the curved doors non-linear. 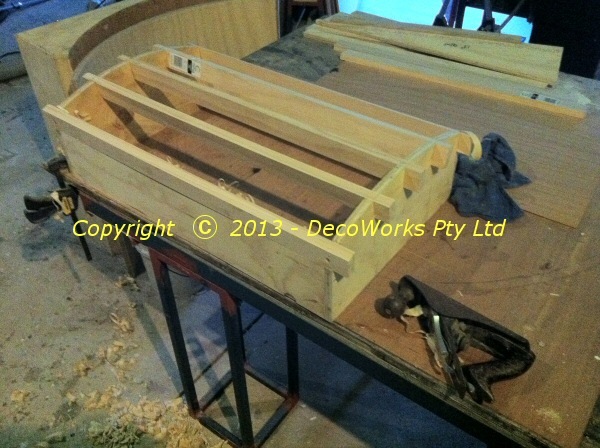 The join line is further complicated because it needs to taper in to hide the end grain of the sides and the doors. The first step is to make a curved panel that can be cut to the required shape. The only way to make this is to make a form that has the same radius as the door, and laminate several sheets of 3 ply together inside the form. 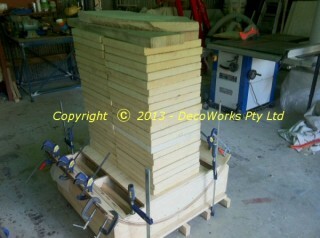 The glued sandwich of plywood is placed into the form and clamped in place with heavy weights until the laminate dries. 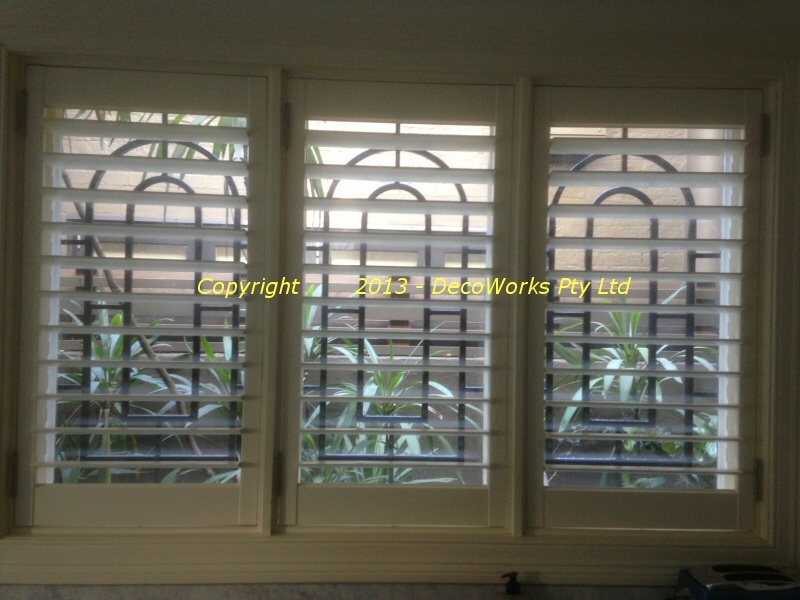 When the panel is removed it is the same shape as the form. 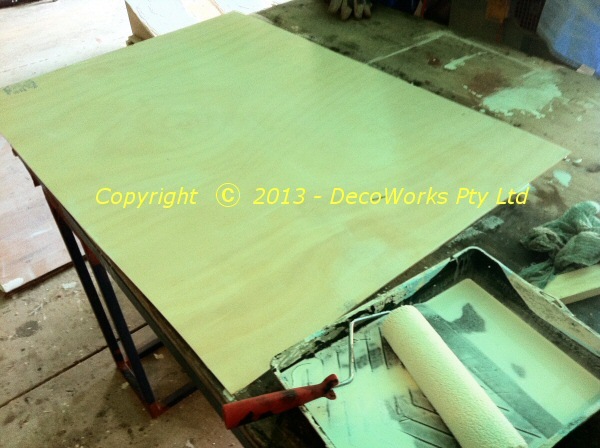 The following photos illustrate the steps involved in making the curved cabinet doors panel. Routing the radius for the curved panel support frame. 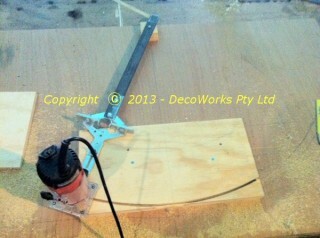 This will make the curved panel easier to handle. The next step is to cut the two doors and drawer fronts from the tapered curved panel. 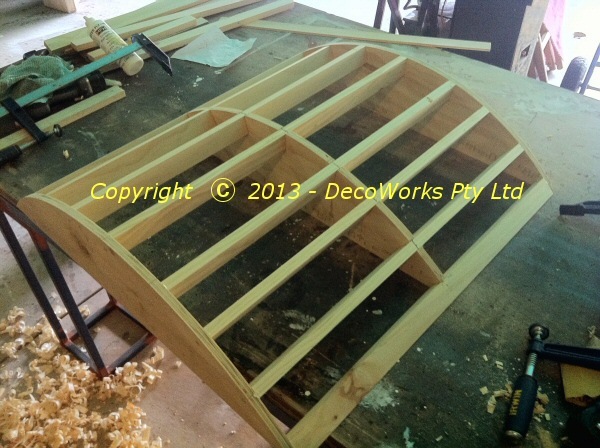 This requires a special jig to be built so the elliptical curve between the sides and the door can be accurately cut. These in turn will need to be held in position for the mating of the side panels and central hinge support. 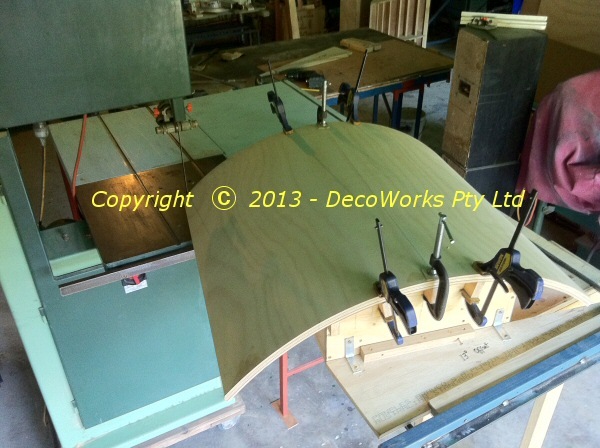 The next blog post will illustrate the steps involved in this process to make the curved cabinet doors. 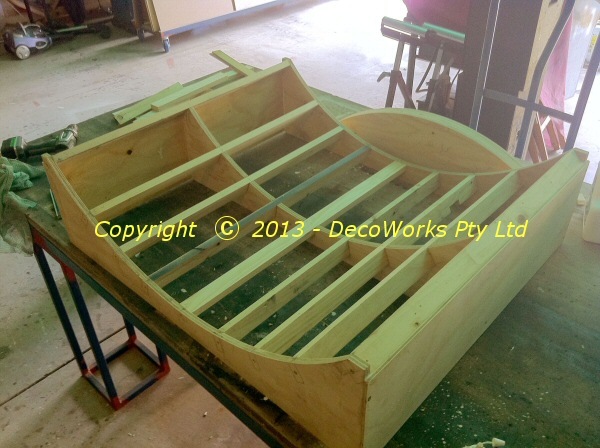 Several months ago DecoWorks was approached by Theatre Historian and designer, John Love, about the possibility of building an illuminated surround for the Wurlitzer organ at the Cremorne Orpheum in Mosman. Illuminated surrounds were hugely popular during the 1930’s and 40’s in England largely due to the creativity of the John Compton Organ Company who built around 260 instruments in their heyday. 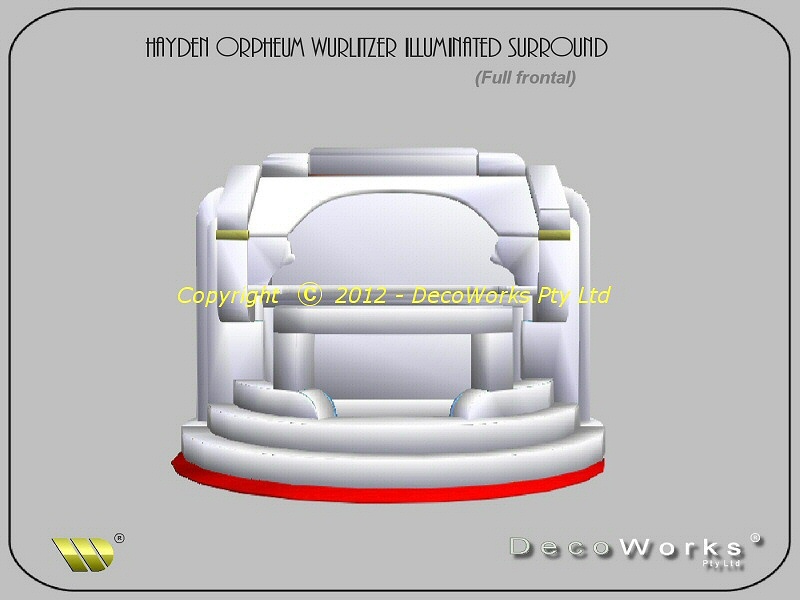 John’s passion for the Orpheum was infectious and a great inspiration to explore the possibility of building an illuminated surround that would capture the feeling of those early illuminated surrounds built by the John Compton Organ Company. 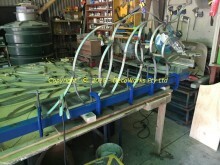 The only design constraint was that it couldn’t be larger in diameter than the revolve on which the organ console sat (so it could rise up through the hole in the stage floor and rotate) and the height was critical as there was virtually no clearance from under the stage floor to the top of the console when it was in its lowered position. The first task was to accurately measure the available space and the organ console itself. 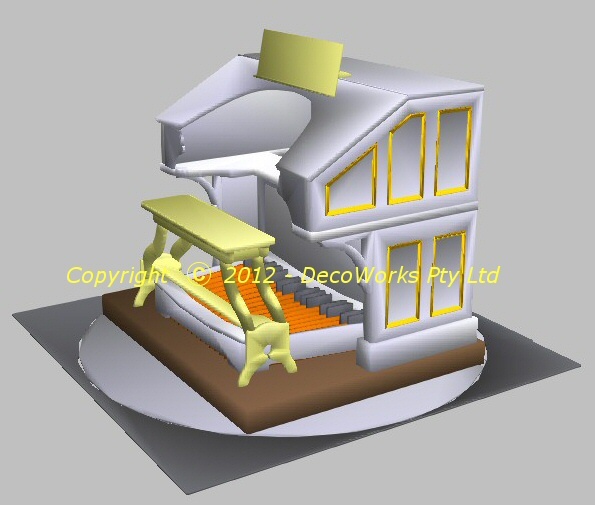 John organised for access to the under stage area where the organ was located and, from the measurements taken, a 3D CAD model of the console and revolve was produced. Using this 3D model the design of the surround could proceed so that it was a snug fit around the console so as to use all the available space. 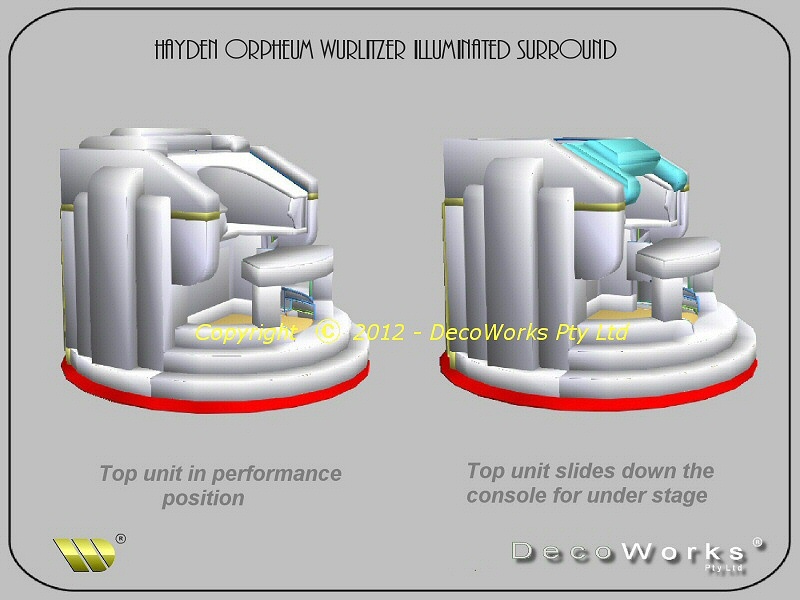 The main problem was the configuration of the light boxes and how to fit them aesthetically to the console. 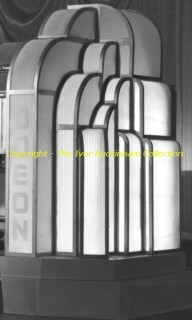 The Cascade style surround from the Odeon at Haverstock Hill. 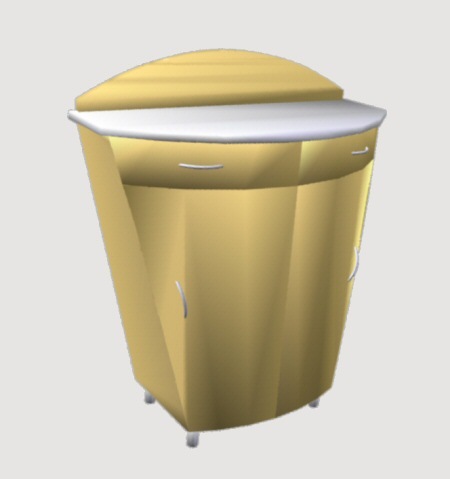 Inspiration for the design came from an early Compton example of the Cascade style with the surrounds fitted either side of the console. 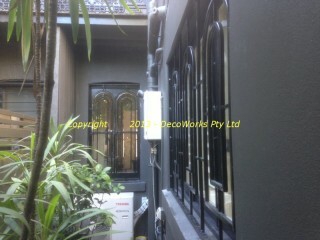 Some of these surrounds were quite large and impressive as can be seen in this post. 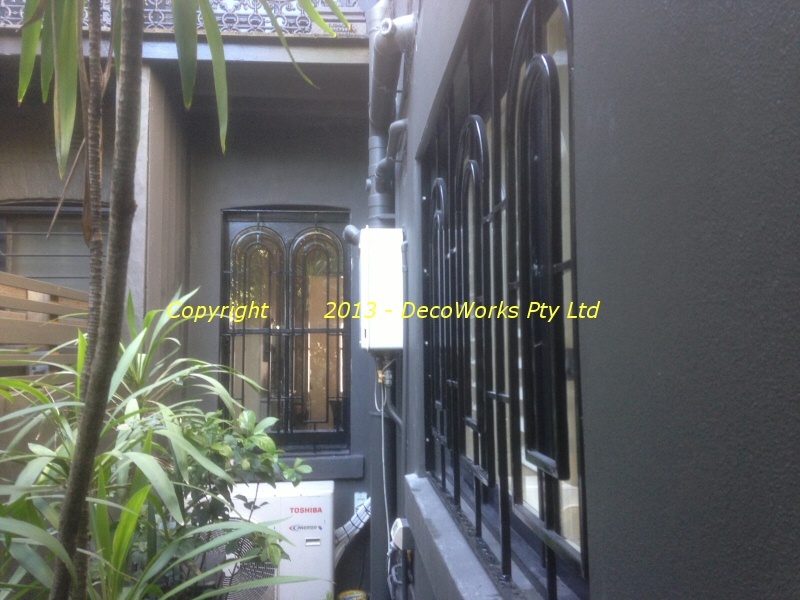 A different configuration was needed to accommodate the restrictions imposed by the revolve. To make the most efficient use of the available space an illuminated stepped platform plinth with a built-in illuminated seat was devised. 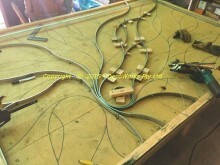 This integrated the surround with the organ console rather than being a separate *add-on*. 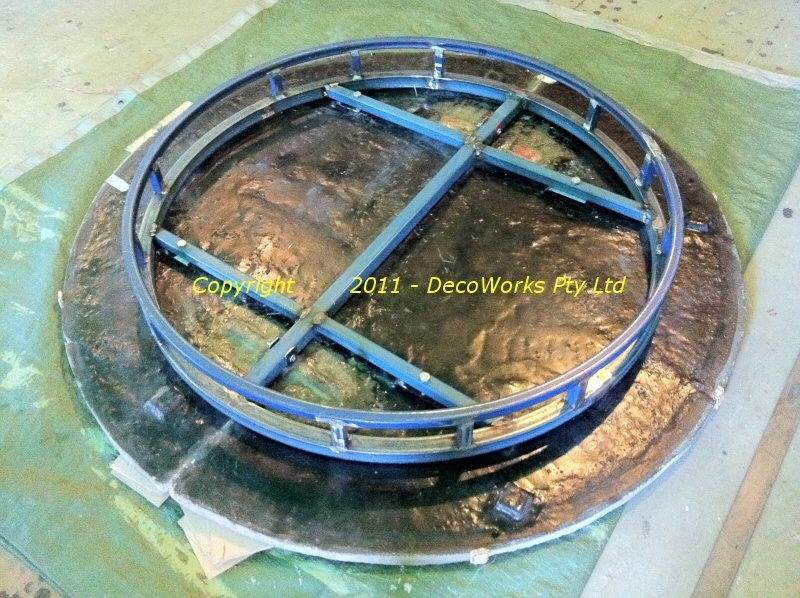 The limited space above the console meant the illuminated top section would have to be manually moved into position after the stage trapdoor opened. 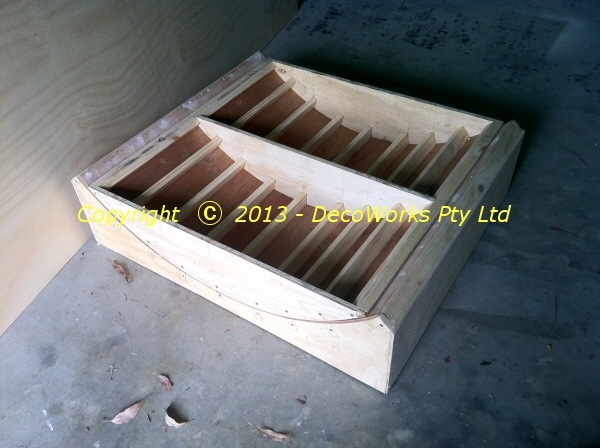 Likewise when the console was lowered the top section would need to slide down into its stowed position for the trap door to close. 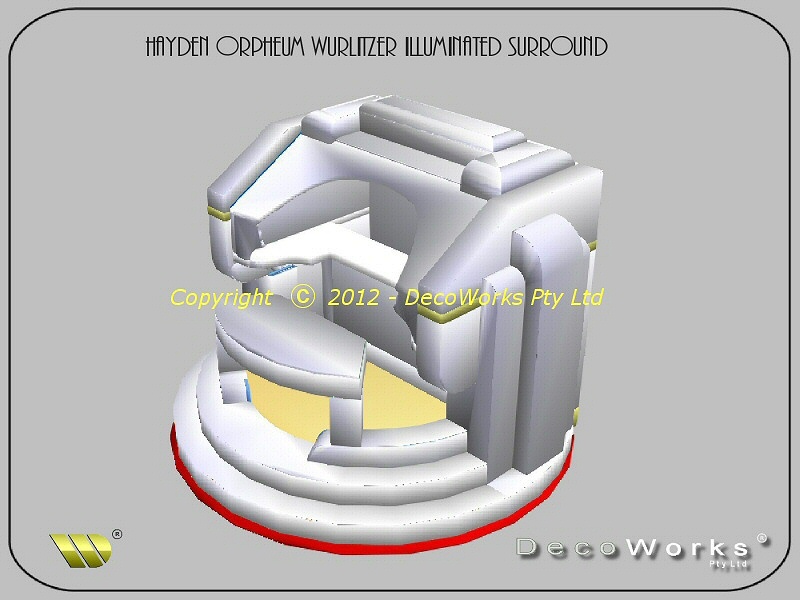 Illumination of the shallow light boxes would be achieved using modern LED technology. 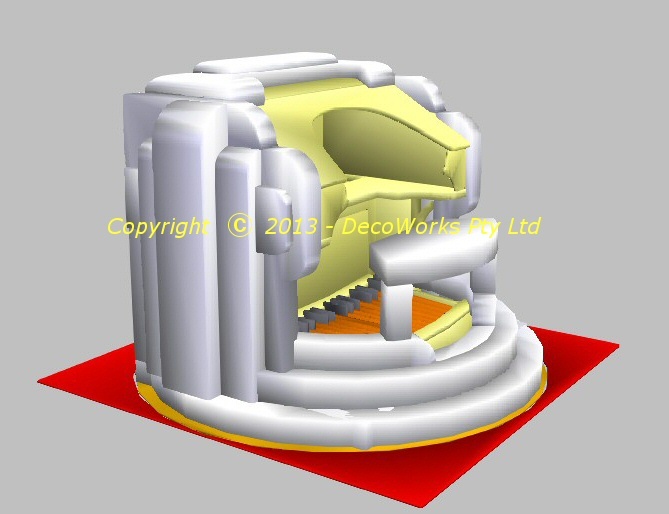 This has the advantage of infinite colour variation and also lends itself to DMX programming to produce quite complicated lighting effects. 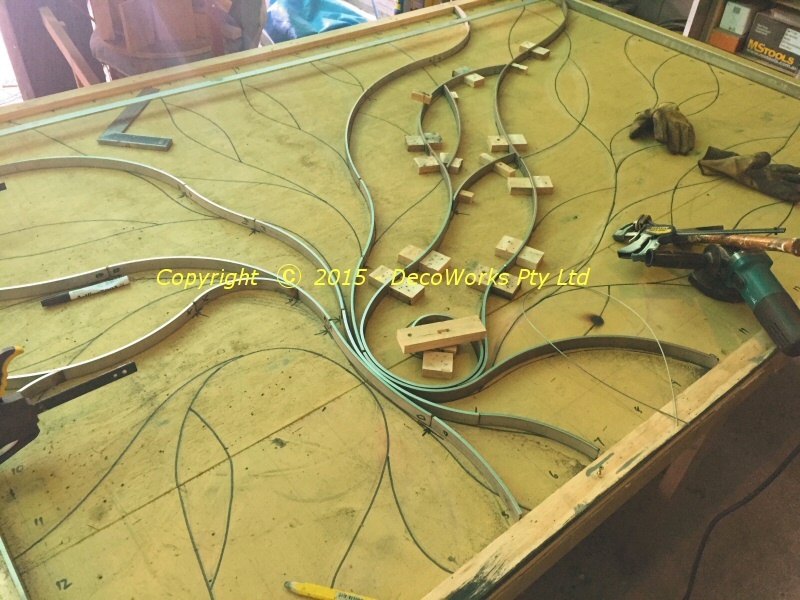 This will be further enhanced by having each section of the surround, including the stepped base platform, on separate programmable circuits which could produce some spectacular effects. 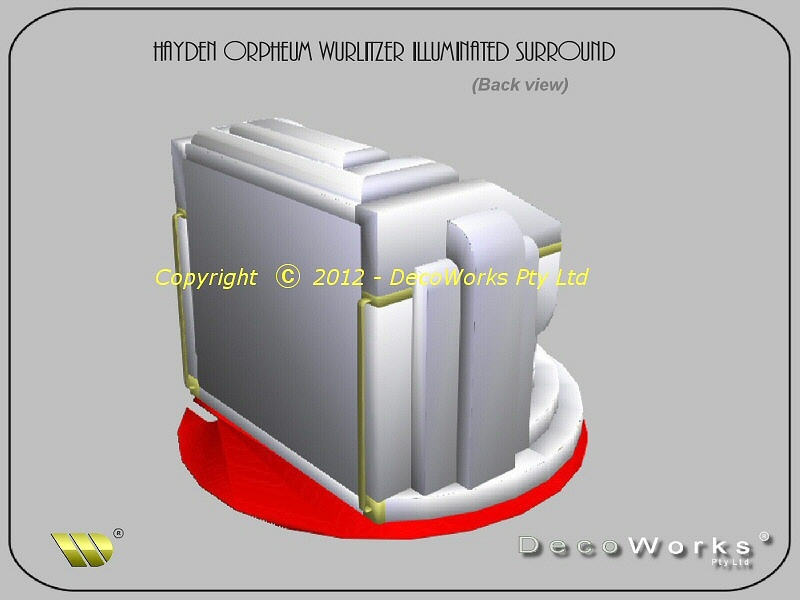 Pictured below are the final illuminated surround 3D renderings. 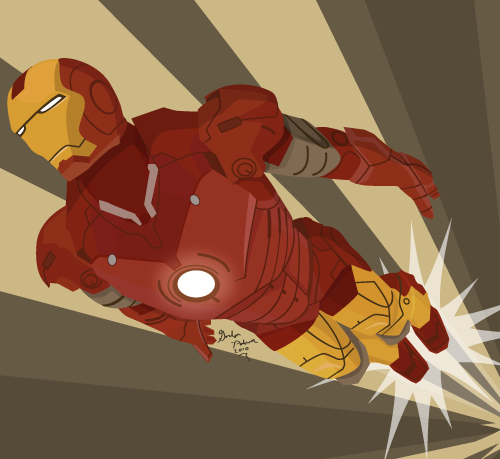 Only time will tell if this concept ever leaves the page and becomes a reality. 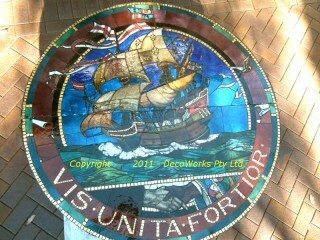 The mosaic plaque was in two halves and was originally used as a wall plaque for an unknown company in Hong Kong. Somehow it then ended up in Singapore and, as nobody wanted it, would have been discarded if not salvaged by the current owner many years ago. 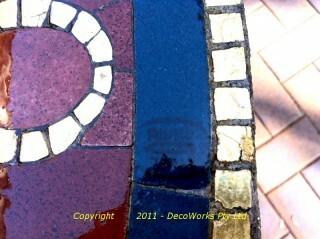 The mosaic was very heavy and, having a cement back, prone to being broken if treated roughly. 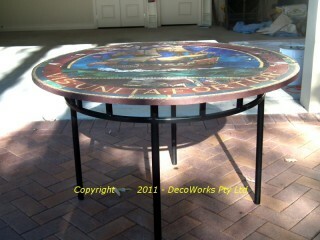 To give the mosaic as much support as possible a circular table base was designed to offer uniform support around its circumference. 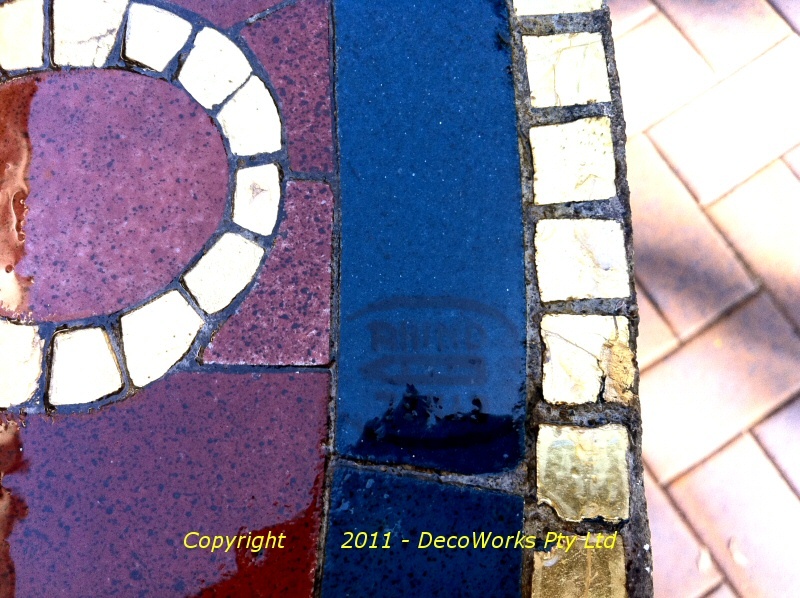 The existing two brackets that had been fibreglassed to the back of both halves were utilised to fix the mosaic to the new table base frame. Additional steel brackets were made and fibreglassed down the middle edge of both halves to stop the halves flexing when the table was lifted by the edge. While cleaning the mosaic with the client after it had been fitted to the table base Ethel Rhind’s signature was discovered on the edge of the mosaic. It had gone unnoticed for years and was an unexpected bonus for the owner who now has a steel mosaic table with a history as colourful as its theme. 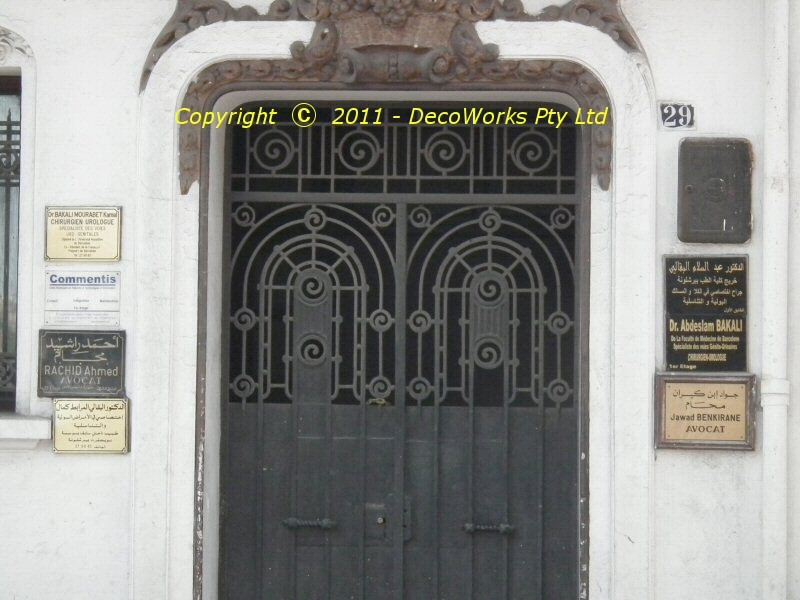 A walk around the central area of Casablanca in Morocco reveals a treasure trove of Art Deco architecture and design. Many of the Art Deco buildings are in a poor state of repair but overall it is an adventure exploring the streets to see what gems you can find. 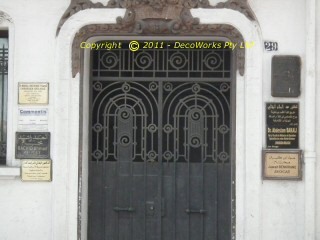 What really caught my eye were the many fine examples of wrought iron security doors and grilles. 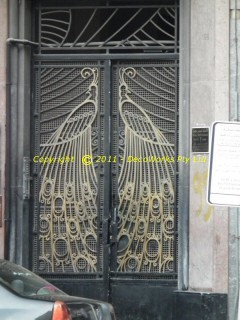 Every second building had these wonderful works of art in their doorways. Here a a few exceptional examples of Art Deco wrought ironwork I discovered. 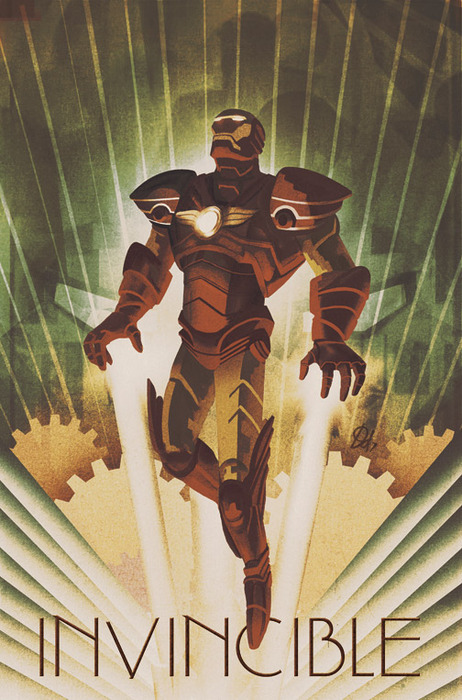 I recently found these Art Deco Ironman poster designs by making a general search for “Art Deco” on Google. 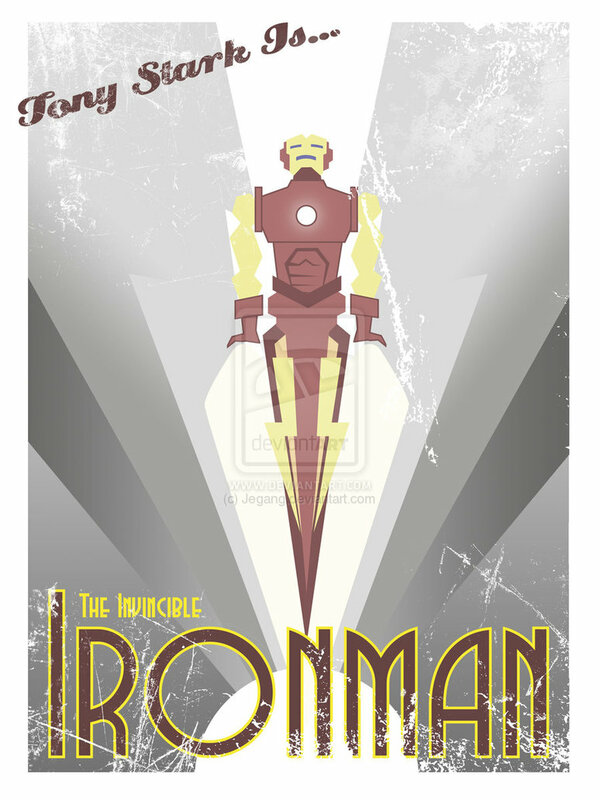 Various artists have done their own interpretation of an Art Deco Ironman poster which all look great and capture that Art Deco feel of the poster art from the 30’s and 40’s. Mike Del Mundo, Jegang and GordoMedia can be found at DeviantART.com while Eric Canete is an illustrator and designer who lives in Los Angeles and works in the animation and comic book industries. 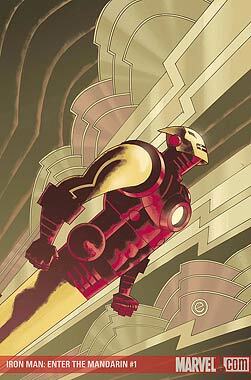 These artists Art Deco Ironman drawings are just a fraction of the brilliant artwork they produce.